Background: An association between irritable bowel syndrome (IBS) and small intestinal bacterial overgrowth (SIBO) has been found. Objective: To compare the prevalence and test results for bacterial overgrowth between IBS and fibromyalgia. Methods: Subjects with independent fibromyalgia and IBS were compared with controls in a double blind study. Participants completed a questionnaire, and a lactulose hydrogen breath test was used to determine the presence of SIBO. The prevalence of an abnormal breath test was compared between study participants. Hydrogen production on the breath test was compared between subjects with IBS and fibromyalgia. The somatic pain visual analogue score of subjects with fibromyalgia was compared with their degree of hydrogen production. Results: 3/15 (20%) controls had an abnormal breath test compared with 93/111 (84%) subjects with IBS (p<0.01) and 42/42 (100%) with fibromyalgia (p<0.0001 v controls, p<0.05 v IBS). Subjects with fibromyalgia had higher hydrogen profiles (p<0.01), peak hydrogen (p<0.0001), and area under the curve (p<0.01) than subjects with IBS. This was not dependent on the higher prevalence of an abnormal breath test. The degree of somatic pain in fibromyalgia correlated significantly with the hydrogen level seen on the breath test (r = 0.42, p<0.01). Conclusions: An abnormal lactulose breath test is more common in fibromyalgia than IBS. In contrast with IBS, the degree of abnormality on breath test is greater in subjects with fibromyalgia and correlates with somatic pain. In this study we tested in a prospective study the hypothesis that an abnormal LBT is associated with both IBS and fibromyalgia. We further tested whether any differences are seen in the LBT between these two conditions. Lastly, because research suggests a relationship between hydrogen levels on breath testing and degree of bacterial load,7 we evaluated whether there is a correlation between the hydrogen level and somatic pain in subjects with fibromyalgia. All subjects were excluded if they had used antibiotics within the previous 3 months, or had had a previous LBT, history of diabetes, thyroid disease, intestinal surgery (except cholecystectomy or appendectomy), connective tissue disease, narcotic use, or known gastrointestinal disease. Subjects with renal insufficiency, hearing impairment, probiotic use, and allergy to aminoglycosides were also excluded because they were recruited as part of a treatment study. Approval from the institutional review board and written informed consent from the participating subjects were obtained. After an overnight fast, subjects ingested 10 g of lactulose syrup (Inalco Spa, Milano, Italy, packaged by Xactdose Inc, South Beloit, IL) after a baseline breath sample had been obtained. Breath sampling then continued every 15 minutes for 3 hours. All breath samples were end-expiratory and analysed immediately by a model DP Quintron gas chromatograph (Quintron Instrument Company, Milwaukee, WI). The concentration of hydrogen and methane was measured in parts per million (ppm). Measurements were determined and plotted by a technician independent of the research team. All test results were coded and randomised. These were then interpreted by a “blinded” reader (MP). The LBT was considered normal if there was no rise in hydrogen (H2) or methane (CH4) concentration before 90 minutes of lactulose, with a definitive rise never more than 20 ppm during 180 minutes of measurement.10,11 All other tests were considered abnormal. The prevalence of an abnormal breath test was compared between subjects with IBS and those with fibromyalgia and controls. Subsequently, the degree of hydrogen production was compared between IBS and fibromyalgia. A somatic pain visual analogue score (100 mm) was completed by subjects with fibromyalgia. Subjects were asked to draw a vertical line through a horizontal line indicating the current intensity of their musculoskeletal pain. This degree of pain was then compared with the degree of hydrogen production on the lactulose breath test. Qualitative data were compared using a χ2 test. Any differences in breath hydrogen concentration between groups were compared using a t test. Finally, the degree of hydrogen production and its relationship to pain was assessed by linear correlation. Significance was established at a p<0.05 and data were expressed as mean (SE). Forty two subjects with fibromyalgia and 111 subjects with IBS were included for analysis. The mean (SE) age of the subjects with fibromyalgia was 46.6 (0.3) and of the subjects with IBS 43.2 (0.1) (p = NS). Of the 42 subjects with fibromyalgia, 36 (86%) were female compared with 62/111 (56%) subjects with IBS (χ2 = 10.5, p<0.05). 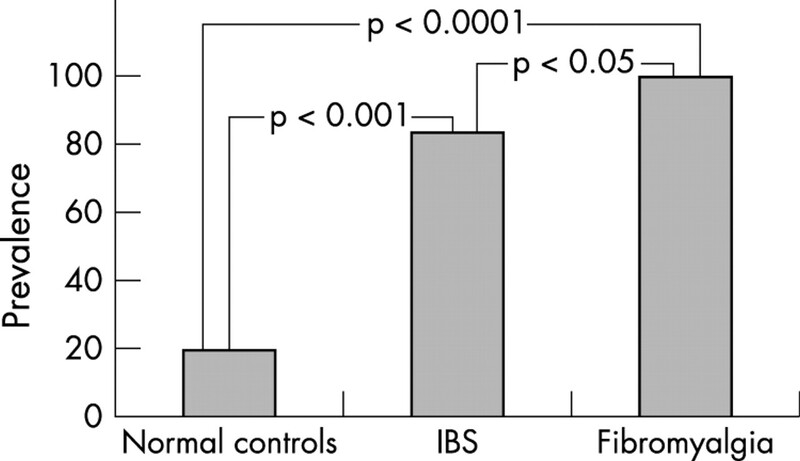 The prevalence of an abnormal breath test between normal controls, patients with IBS, and patients with fibromyalgia was different (fig 1). All 42 subjects with fibromyalgia had an abnormal LBT compared with 93/111 (84%) subjects with IBS (χ2 = 6.2, p<0.05) and 3/15 (20%) normal controls (χ2 = 37.9, p<0.0001). Comparison of the prevalence of abnormal LBT in controls and subjects with IBS and fibromyalgia. Furthermore, significantly greater hydrogen production was seen in subjects with fibromyalgia (fig 2). The mean (SE) area under the curve for subjects with fibromyalgia was 1090 (100) compared with 767 (61) for subjects with IBS (p<0.01), and mean (SE) peak hydrogen production in fibromyalgia was 83.1 (1.2) compared with 47.0 (0.3) for IBS (p<0.00001). Even when normal breath tests were excluded from the IBS group, the difference was still significant. Comparison of the mean LBT readings between subjects with fibromyalgia and those with IBS. *p<0.01; †p<0.001. Of the 42 subjects with fibromyalgia, 41 had enough information for their IBS status to be determined. Of 41 subjects, 22 (54%) met Rome I criteria for IBS. There was no difference in the hydrogen peak or the area under the curve between fibromyalgia subjects with and without IBS. Of the 42 subjects with fibromyalgia, 41 completed the visual analogue score for pain. 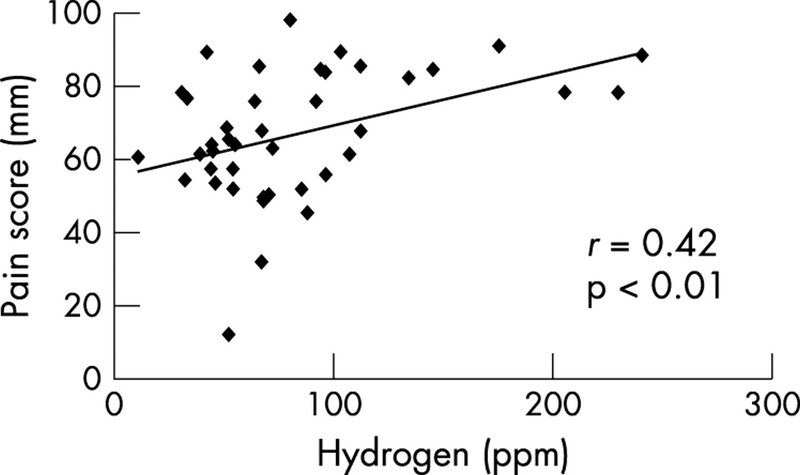 Among these 41 subjects there was a significant correlation between the degree of pain perceived by the subject and the peak hydrogen level seen on breath testing (r = 0.42, p<0.01) (fig 3). Similarly, there was a correlation between the area under the curve and pain score (r = 0.37, p<0.05) (n = 38). Correlation between the hydrogen peak production on LBT and pain on visual analogue score. In this study we show that a common finding in both fibromyalgia and IBS is an abnormal LBT, suggesting the presence of bacterial overgrowth. An abnormal LBT was found in all patients with fibromyalgia in comparison with the IBS group. What remains to be determined is the relationship between bacteria in the gut and hyperalgesia. Studies looking at the effects of endotoxin on pain perception provide some clues. Intraventricular administration of E coli endotoxin to a rat produces global hyperalgesia.14 By extension, endotoxin related cytokines are seen to produce rectal hyperalgesia in animal models similar to that seen in IBS.15 Studies further demonstrate that in the case of SIBO, translocation of these enteric organisms does occur.16–19 This translocation is not innocuous. Hepatic inflammation can be seen from this translocation, which is in part due to a tumour necrosis factor α response to endotoxin from the bacterial overgrowth.20,21 Therefore, translocation and/or endotoxaemia from bacterial overgrowth does occur and has the potential for systemic effects. The additional finding in our study that the degree of pain in fibromyalgia seems to correlate with the degree of hydrogen suggests a possible link between the LBT findings and hyperalgesia. Although it is likely that endotoxin produces hyperalgesia, the common presence of bacterial overgrowth in fibromyalgia and IBS fails to explain the difference in clinical symptoms between these diseases. One possibility is a different host response. Unfortunately, this is difficult to determine and will require more research. Another possibility is that the types or numbers of bacteria in the small intestine resulting in the abnormal breath test in these two groups are different. To try to elucidate this possibility, we compared the hydrogen production during the breath test in subjects with fibromyalgia and in those with IBS and found a much higher level in subjects with fibromyalgia (figs 2 and 3). Therefore, one conclusion may be that the higher hydrogen level in subjects with fibromyalgia represents a larger quantity of small intestinal bacteria. There are two concerns about the study. Firstly, the lower hydrogen production in subjects with IBS might reflect the fact that fewer subjects with IBS had an abnormal breath test, bringing the mean for IBS artificially down. However, even after excluding the normal breath tests in the IBS group, the difference was significant. Secondly, recruitment of the groups was different. For patients with IBS, it was purely through advertising. This was possible because the criteria for IBS are historical. In the case of fibromyalgia much of the recruitment was through a rheumatologist because the diagnosis required an expert examination. In conclusion, this study suggests that an abnormal LBT may be a common link between subjects with fibromyalgia and IBS. Moreover, there appears to be a more pronounced production of hydrogen in an LBT in subjects with fibromyalgia, which appears to correlate with somatic pain perception. Further study is needed to determine if treatment and normalisation of the breath test with antibiotic treatment can produce an improvement in fibromyalgia in addition to bowel complaints. This work was supported, in part, by the Beatrice and Samuel A Seaver Foundation. Triadafilopoulos G, Simms RW, Goldenberg DI. Bowel dysfunction in fibromyalgia syndrome. Dig Dis Sci1991;36:59–64. Veale D, Kavanagh G, Fielding JF, Fitzgerald O. Primary fibromyalgia and the irritable bowel syndrome: different expressions of a common pathogenetic process. Br J Rheumatol1991;30:220–2. Sperber AD, Atzmon Y, Neumann L, Weisberg I, Shalit Y, Abu-Shakrah M, et al. Fibromyalgia in the irritable bowel syndrome: studies of prevalence and clinical implications. Am J Gastroenterol1999;94:3541–6. Pimentel M, Chow EJ, Lin HC. Normalization of lactulose breath testing correlates with symptom improvement in irritable bowel syndrome: a double-blind, randomized, placebo controlled study. Am J Gastroenterol2003;98:412–19. Pimentel M, Chow EJ, Hallegua D, Wallace D, Lin HC. Small intestinal bacterial overgrowth: a possible association with fibromyalgia. J Musculoskeletal Pain2001;9:107–13. Bond JH, Engel RR, Levitt MD. Factors influencing pulmonary methane excretion in man. An indirect method of studying the in situ metabolism of the methane-producing colonic bacteria. J Exp Med1971;133:572–88. Wolfe F, Smythe HA, Yunus MB, Bennett RM, Bombardier C, Goldenber DL, et al. The American College of Rheumatology 1990 criteria for the classification of fibromyalgia. Arthritis Rheum1990;33:160–72. Drossman DA, Richter JE, Talley N, eds. Functional gastrointestinal disorders: diagnosis, pathophysiology and treatment: a multinational consensus. Boston: Little, Brown, 1994. Bond JH Jr, Levitt MD. Investigation of small bowel transit time in man utilizing pulmonary hydrogen (H2) measurements. J Lab Clin Med1975;85:546–55. Joseph F Jr, Rosenberg AJ. Breath testing: diseased versus normal patients. J Pediatr Gastroenterol1988;7:787–8. Chang L, Mayer EA, Johnson T, FitzGerald LZ, Naliboff B. Differences in somatic perception in female patients with irritable bowel syndrome with and without fibromyalgia. Pain2000;84:297–307. Chun A, Desautels S, Slivka A, Mitrani C, Starz T, DiLorenzo C, et al. Visceral algesia in irritable bowel syndrome, fibromyalgia, and sphincter of Oddi dysfunction, type III. Dig Dis Sci1999;44:631–6. Walker K, Dray A, Perkins M. Hyperalgesia in rats following intracerebroventricular administration of endotoxin: effect of bradykinin B1 and B2 receptor antagonists. Pain1996;65:211–19. Bueno L, Fioramonti J, Coelho AM. Brain interleukin-1β and tumor necrosis factor-α generate delayed rectal hypersensitivity in rats [abstract]. Gastroenterology1999;116:A594. Berg RD, Wommack E, Deitch EA. Immunosuppression and intestinal bacterial overgrowth synergistically promote bacterial translocation. Arch Surg1988;123:1359–64. Wells CL, Barton RG, Jechorek RP, Cerra FB. Effect of three liquid diets on cecal bacterial flora and bacterial translocation in mice. Nutrition1991;7:358–63. Guarner C, Runyon BA, Young S, Heck M, Sheikh MY. Intestinal bacterial overgrowth and bacterial translocation in cirrhotic rats with ascites. J Hepatol1997;26:1372–8. Nieuwenhuijs VB, Verheem A, van Duijvenbode-Beumer H, Visser MR, Verhoef F, Gooszen HG, et al. The role of interdigestive small bowel motility in the regulation of gut microflora, bacterial overgrowth, and bacterial translocation in rats. Ann Surg1998;228:188–93. Lichtman SN, Sartor RB, Keku J, Schwab JH. Hepatic inflammation in rats with experimental small intestinal bacterial overgrowth. Gastroenterology1990;98:414–23. Riordan SM, McIvor CJ, Williams R. Liver damage in human small intestinal bacterial overgrowth. Am J Gastroenterol1998;93:234–7.